Scandinavia is located in Northern Europe and consists of three countries: Norway, Denmark, and Sweden. Finland is also at times considered to be a part of Scandinavia, though the term, "Nordic Countries" is often the preferred way to include Finland to the group, as well as Iceland. Because of its location on the Gulf Stream, the temperature in Scandinavia tends to stay pretty mild throughout the year, even though the countries do extend a bit past the Arctic Circle to the north. That being said, like with any country, whether you live close to the mountains, near a body of water, up high, down low, etc., temperatures can definitely vary from place to place. The most common languages spoken here are Danish, Swedish, and Norwegian, though many people speak or understand English as well, which is why English speaking tourists tend to feel comfortable and welcomed with open arms here. Scandinavia has many notable foods, like lingonberries, pickled herring, crispbread, open faced sandwiches, pea soup, flour pancakes, Gravadlax, and many others. The widely used term, “Smörgåsbord” originated in Scandinavia, which refers to a large buffet style meal, consisting of a variety of hot and cold dishes. 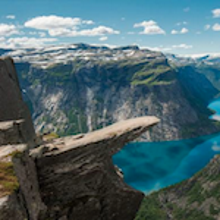 Nordic Saga Tours offers many tours to Scandinavia that will highlight the most important and beautiful parts of each country in the Scandinavian region. On our week long Splendor of the Fjords tour, you will experience Norway's breathtaking fjords up close, see towering waterfalls like the Bridal Veil and the Seven Sisters, and take a ride on the famous Flam Railway. Or, extend your vacation and try our Fabulous Scandinavia tour where you'll spend 10 days exploring Copenhagen, Oslo, Bergen, and Stockholm. Grand Scandinavia is one of our most popular tours. For two weeks, Nordic Saga Tours will take you through Scandinavia by plane, bus, ferry, train, car, boat, you name it! We want you to experience these countries in all their glory, so by taking you through each place in different ways will give you the most unique perspectives. In Copenhagen, visit the Tivoli Gardens, the most famous amusement park and pleasure garden in Denmark. See ancient Viking ships, stroll through the Munch Museum, and experience the brilliant Vigeland Sculpture Park in Oslo. As you travel on to Bergen, you will get to see the city’s popular Fish and Flower Market as well as the famous Bryggen Harbour. Take a ride on the Bergen and Flam Railways and be amazed by the beauty of the fjords in Balestrand and Geiranger. In Oslo, cross the wild Grotli Mountains and visit the country’s famous 14th century stave church. After exploring Oslo, we will enter into Sweden and spend a few days there, admiring the forests, lakes, and gorgeous landmarks including the City Hall and enchanting Old Town. Your tour ends in Helsinki where you will relax on a ferry cruise, see notable sights like the Uspenski Cathedral, the Parliament House, and Senate Square. All of these sights and more are waiting to be seen. Experience the vacation of a lifetime and let Nordic Saga Tours be your guide as you travel Scandinavia!